Our aim is to offer our customers the cheapest flights possible by comparing the flight ticket prices of our 650 partner airlines. With Gotogate you can easily and securely search, book and pay for flight tickets and trips to all over the world. And we have 300,000 hotel and holiday rentals for you to choose from, as well as car rentals across all model types and price ranges. Gotogate is part of Gotogate International AB which is owned by Etraveli Group AB (publ), the second largest flight-centric online travel agent in Europe. The company operates in 72 countries and on 6 continents. 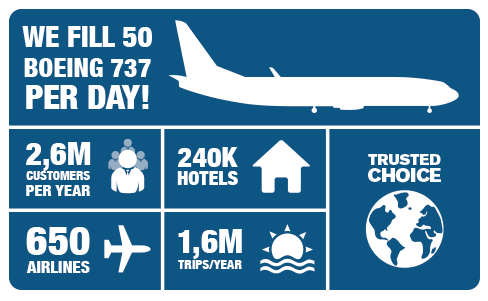 With close to 12 million customers per year and over 4 million holidays sold, Etraveli Group fills 140 Boeing 737s every day. The group has extensive experience in the industry and has been running its travel agency business since 1989. Starting to sell flights online already in 2000, they were one of the first e-commerce travel companies in Scandinavia. You can shop securely with us, as we use the highest available encryption standard for safe data and payment handling so that there is no unauthorised access to your personal details. Our staff are IATA certified and possess excellent levels of expertise in the travel industry. Make a TRUSTED CHOICE and book with Gotogate - read more here. All marketing on this site is managed by Gotogate International AB. Book your next trip with us!